One of my ongoing skincare goals is to seek out the latest beauty products with the best results for achieving a healthy glow. Healthy and youthful of course go hand in hand. Oh, to have my nine-year-old’s gorgeous skin and go back in time and proactively take better care of it! At 50, I’m in full defense mode. I’m not anxious to start lasering and injecting… I’m not going to say “never,” but I’m trying to avoid it as long as possible by using the best products and staying out of the sun. Thankfully, I’ve kept my face out of the sun since I was in my mid-20s, when my face developed brown patches and I flipped out. No more tanning for me! On to my latest product find. 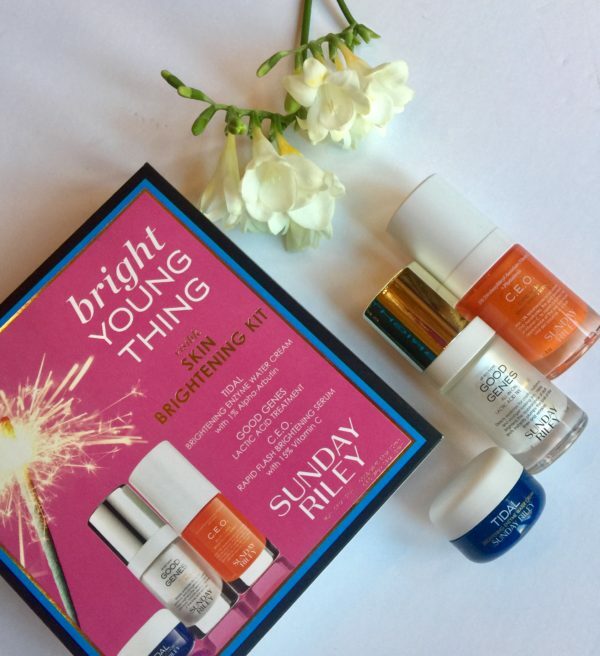 I discovered Sunday Riley when my niece gave me their “Bright Young Thing” starter kit for Christmas. Yes, the title is catchy AND I figured if it comes even close to brightening up my uneven-toned, combination skin, it’s a win. The kit contains three products with more cute names that promise to be good for all skin types. Designed to exfoliate, plump lines and brighten skin, Good Genes is a lactic acid treatment and I love how it tingles on my face. I have sensitive skin and started using it every night at the end of December and have yet to experience any irritation or redness. Win! After applying Good Genes, I layer on the Tidal Brightening Enzyme Water Cream, which contains hyaluronic acid for intense skin hydration. In my experience, products with hyaluronic acid work very well to plump your skin instantly. (I also love the Intraceuticals Line Wand with hyaluronic acid which is ideal for carrying in your purse for last minute touch-ups and line plumping! Read my post — “7 Beauty Products I Swear By”) The third product, CEO Rapid Flash Brightening Serum, can be applied twice daily for instant brightening and plumping as well. While the results haven’t been super dramatic, my skin definitely looks smoother and my brown patchy areas of skin have faded. WIN! For those of you with dark spots and sun patches that aren’t ready to do a chemical peel or go under a laser, this regimen is a great way to see some gradual and definite results. 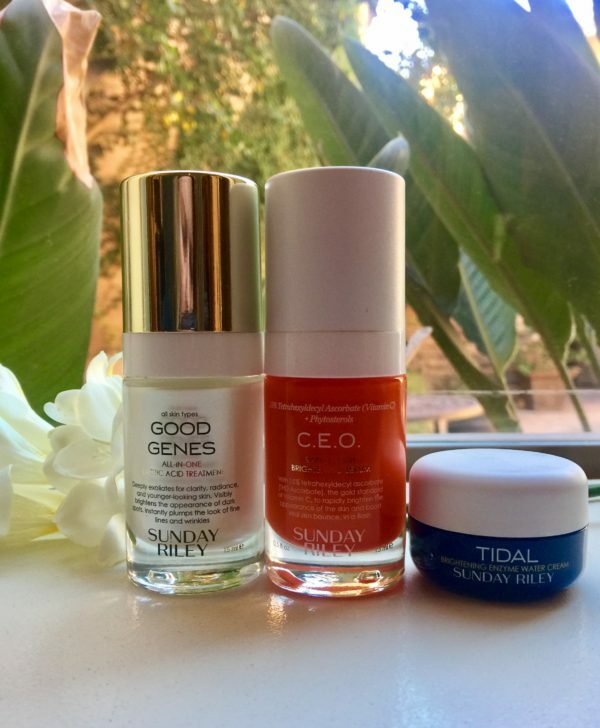 While Nordstrom, Neiman Marcus and Dermstore carry the Sunday Riley line, Sephora is the only retailer that sells this starter kit and, at .5 ounces each, these products will last quite awhile. It’s a great deal! P.S. This is NOT a sponsored post, nor did the company send me the products.